The Buckinghamshire Bird Club was formed in 1981 and was granted charity status in 1989. It was formed with the objective of bringing together under one organisation all those interested in birds in the county. All birders from the complete novice to the skilled ornithologist are able to enrich their interest and encourage nature conservation by joining the Buckinghamshire Bird Club. The website therefore contains information on club activities, club services as well as providing information on recent bird sightings. In addition, information is provided to give birders access to the tools to allow them to contribute their own bird sightings. Finally there is a variety of reference information which includes information on birding sites within the county, the bucks bird list and a selection of photographs of birds, all taken within the county. While this website does provide birders with information on recent sightings, it in no way competes with the more comprehensive monthly bulletin and bird report and the Annual report, which all club members receive. For details see membership page. If you have and comments, suggestions or would like to contribute material for the website please contact Jim Rose. 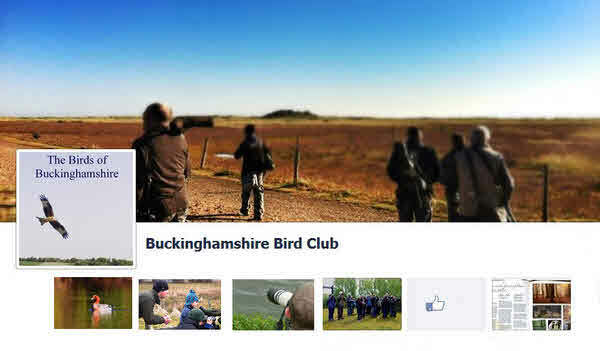 The Buckinghamshire Bird Club was formed in 1981 and was granted charity status in 1989. It was formed with the objective of bringing together under one organisation all those interested in birds in the county.Â Previously, no single natural history organisation effectively covered the whole of Buckinghamshire. Â Now, all birdwatchers from the complete novice to the skilled ornithologist are able to enrich their interest and encourage nature conservation by joining the Buckinghamshire Bird Club. 1. To advance the education of the public in the knowledge and understanding of ornithology in Buckinghamshire. 2. To collect data on birds and their habitats within Buckinghamshire, which is of value to conservation authorities, e.g. English Nature, BBOWT, RSPB and other relevant bodies. 3. To promote a responsible attitude in bird watchers. Indoor:- Each Autumn and Winter, monthly indoor meetings feature illustrated talks by local and nationally known speakers, and are a welcome get-together for club members. Outdoor :- Field meetings ranging from half day to weekend trips are held during the year and are attended by both beginners and experienced birdwatchers. Field meetings are held at sites within the county as well as interesting sites within a reasonable travelling distance. An annual weekend to Gibraltar Point in Lincolnshire takes place each autumn and even the occasional visit abroad has been arranged. The Club has organised a most successful Garden Bird Survey since 1986 and members assist in national surveys organised by the British Trust for Ornithology and the Wildfowl and Wetlands Trust. Club members also support local nature conservation by continuously surveying key sites in the county. The Buckinghamshire Bird Report is published annually and incorporates the County Recorder’s systematic list of reported sightings, the ringing report, detailed reports on rare sightings, and other articles. This publication is sent free to all members towards the end of the following year.